New Delhi: In continuation to support the ‘Bharat ke Veer’ initiative, Dalmia Bharat, the world’s greenest cement company, organised a fund-raising event here at Teen Murti Bhavan, New Delhi today. The event was attended by the Hon’ble Home Minister, Shri Rajnath Singh along with both the Ministers of State for Home Affairs, Kiren Rijiju and Hansraj Gangaram Ahir. Also in attendance were senior officials of the Home Ministry and all the heads of the Central Armed Police Forces. A tremendous amount of more than Rs 13 crore was raised with the participation and contribution from celebrities like Akshay Kumar, Kailash Kher and Corporates Houses. The event also witnessed the launch of an Amar Chitra Katha graphic novel depicting the stories of CAPF’s Brave Heart Soldiers and the sacrifices made by them. 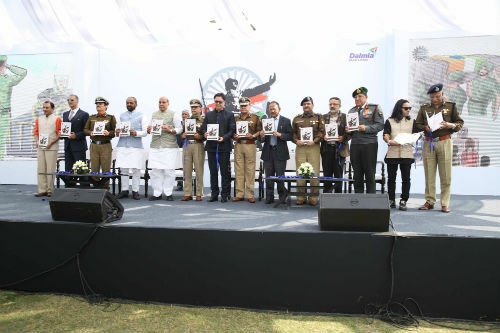 In addition to support the cause further, the reputed band Kailasha, led by renowned singer Kailash Kher have released an anthem created for Bharat Ke Veer, at the event. Also shown at the event was a heart-wrenching film specially directed and produced by renowned documentary maker Adi Pocha showcasing the families of some of the martyrs. Started in 2016, Bharat Ke Veer is an initiative of the Hon’ble Home Minister to enable civilians to contribute to the family of the martyrs of Combined Armed Police Forces. 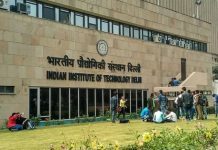 At present the donation per family is limited to Rs 15 lakh which could generate an annuity of Rs 1.2 lakh pa (Rs 10,000 pm). The Fund is directly administered by the Ministry of Home (Govt of India) and is given as an annuity or one-time grant to the family of the martyred soldier as desired by the donor. The target is to raise Rs 1500 crore so that families of CAPF martyrs over the last 10 years can be benefitted.